An elegant Object Oriented C++ library for arbitrarily large integer numbers and arbitrarily precise rational numbers. Before using the Proper Numbers Library you must agree with the Software License. The Proper Numbers Library is a small, efficient and fast set of C++ classes which allows representation of arbitrarily large integer numbers, arbitrarily precise rational numbers and quadratic-like irrational real numbers in a natural way. The classes are defined in header files only, and so it is only necessary to include these header files in the h/cpp files of a project (and if required, to add them to the project) to have the library up and ready to use. Why was the Proper Numbers Library created? As a final year student in mathematics, I had to produce an MSci dissertation project. The name of the project that I chose was the Mean Median Map. The Mean Median Map is a recursive function which appears to have very complex behavior and spectacular dynamics, but in fact it is a very simple function. The nature of the problem is such that if one is to emulate the map, they need an absolute precision in all computations. Since the floating point numbers usually used for computations are not precise and I needed to emulate the map in order to see its behavior in different circumstances, I created the Proper Numbers Library with the desired properties. The Proper Numbers Library uses the Object Contextualization Model which I developed separately in late 2009, but I never had the time to write a paper on it and publish it. However, since I have used it in the Proper Numbers Library, I thought it best to describe and publish it. Thus the Mean Median Map project brought forward three very good results: 1) explained the nature of the map; 2) the Proper Numbers Library; 3) made me finally publish the Object Contextualization Model. In my view, the most interesting part of the Mean Median Map project for both computer scientists and mathematicians is the fact that the sole reason that allowed me to understand how the map works was my constructivist view of the world which was enforced by computer science. In this project, Computer Science and Mathematics are complementary to each other and the product of that beautiful marriage was that the nature of the map was explained. For the record, I do not find it appropriate to separate Computer Science from Mathematics, I think that they are one and the same thing. If you cannot read the document please: click here. The Mean Median Map software application, is included as an example project using the Proper Numbers Library. Why is the Proper Numbers Library called "Proper"? Integer Numbers: As you probably already know, computers work with fixed size binary fields called registers. These registers tend to overflow in some cases, and when this happens, the number they hold most likely becomes wrong, i.e. not representing the value it should, unless of course if the software in fact represents the right type of modular arithmetic. The latter is not very usual at all, so usually developers have to always make the correct choice in setting the size of their variables so that they do not overflow. In fact, computers always work in modular arithmetic Z28, Z216, Z232 or Z264 depending on the registers that are being used, and developers usually want to keep the calculations and the numbers they work with within one partition and subgroup of Z. When working with assembly languages, developers can check for various carry and overflow flags that the processor sets when overflows occur, but these are lost when working with high-level languages. To summarize, the problem with integers in computers is that they wrap up, so we can say that integers in computers are not exactly proper as they are in fact modular integers. Real Numbers: The floating point numbers in computers are an attempt to represent the Real numbers ℜ, and thus in some languages they are called REAL as opposed to float or double in others. The floating point numbers have more drawbacks than advantages. The only advantage that they have is that they are easy to work with, and when a machine is equipped with a mathematical coprocessor, which is the case for most modern computers/processors, they can be very fast to compute with. The disadvantages that they have are that they do not represent all numbers, even within the range on which they are defined. Floating point numbers also have very irregular distribution on the number line. They are denser near the zero and further away from each other as moving away from the zero. In fact the floating point numbers are nothing more than a poor set of irregularly distributed rational numbers in exponential notation. Further, because of their incompleteness, they introduce accumulative rounding errors which are dependent on the actual numbers being computed. In other words, floating point numbers are a very bad choice when precision is essential. There are also significant problems with the definition of the real ℜ numbers, and therefore with their REAL/double floating point representatives. Real numbers are supposed to present a continuum, which of course for a computer scientist is an absolute nonsense. Real numbers are defined in two ways. The first way is axiomatically - one just decides to believe in them. Well, I decide NOT to believe in them because there are more and better reasons to believe that the world is discrete. The second way for defining the Real numbers is by converging infinite Cauchy sequences, which in brief says that if one is to add infinitely many rational numbers, in particular cases you will end up with a Real number. Of course, that is not plausible for computer scientists since operator on rational numbers always returns rational numbers, and infinity does not matter in the slightest. It does not matter how many times a rational operator is applied - it will always return a rational number since it is defined in such a way. Secondly, applying an operation infinitely many times is possible only in one's imagination, but not in any reality. Thirdly, infinity does not exist, and therefore neither does continuum, nor do Real numbers, regardless of attempting to define them axiomatically or by infinite Cauchy sequences. In short, for computer scientists, real numbers in general are things that are in fact impossible to believe in. Of course Real ℜ numbers, being unreal, are also never used in practice. In practice, people always work with rational numbers with some appropriate precision - always rational - be it to fly an aircraft, build a microprocessor chip or whatever else. To summarize, the problem with floating point numbers in computers is that they are very few, they are imprecise and they are very much distorted, so we can say that floating point numbers are not exactly proper. Irrational Numbers: Irrational numbers are not present in computers at all. The Proper Number Library makes an attempt to present them in the form of a Quadratic-like family of numbers. Thus, numbers such as √2 are presented in the form: a ± fun( b ), where a, b ∈ Q and fun is a function such that fun-1 exists. However, there are some problems with the model. Irrational numbers are very rarely used in general software development as computations are normally carried out numerically and not symbolically. Although there are problems with the definition of the irrational numbers in the Proper Number Library, they are sufficiently well-defined for the purposes of the Mean Median Map and it is likely that this is also true for most other purposes that they might be required for. However, a proper investigation on the problem is required. 1. It works with truly existing numbers - the Integer and the Rational numbers. 2. The numbers are able to expand arbitrarily. (Any existing number that exists in the Universe of Discourse (assuming a discrete world) is representable (up to available memory)). 3. The numbers are well behaved and evenly distributed. 4. The library is small and very efficient. The Integer class represents unsigned integers with arbitrary precision. Objects from this type expand arbitrarily large up to available memory and are able to accommodate arbitrarily large numbers (up to the available memory). Integers in a digital computer are manipulated by bit fields called registers able to do bitwise operations and operations on the whole field, such as ADD (add), ADC (add with carry), SUB (subtract), AND (and), OR (or), etc. These are called instructions. There are a number of flags in the processor's Control and Status register that signal or indicate about different conditions that may have occurred. For example, overflow after an addition operation. Depending on the number of bits in the register, it is a variable of type Z2number-of-bits usually Z28, Z216, Z232, Z264 and operate in the respective modular arithmetic. High level languages utilize the processor registers to perform arithmetic and other operations on the content of the memory. Integer variables in high level languages are byte arrays with sufficient size located in the memory and are designated with its name in the metaspace. When an integer variable is larger than the largest register able to perform integer operations, the compiler/assembly programmer typically uses a loop and the status flags applying the operation throughout the whole array working in Z2number-of-bits-in-variable. Thus if a variable is 128 bit (16 bytes) and the largest arithmetic register is 16 bit, the compiler will place a function call for every arithmetic operation on the variable. There will be a loop from 1 to 16 iterations in the body of function using appropriate processor instructions on only 16 bits (2 bytes) at a time, achieving correct results in Z2128. The Integer class from the Proper Numbers Library uses a similar approach, but instead of using constant size arrays to represents integers, it uses a generic linked list. Each number is composited from one or more 64 bit words. Arithmetic operations are implemented using a set of appropriate fast algorithms. When the operation is about to produce a number with a greater size then the current one, it is carried out and adds more space to the number and thus overflows do not occur. Hence the integer class represents N (up to the available memory in the system). Shift to right and subtraction decrease the size of the number (object). Empty number is not allowed. Zero is represented with one 64 bit word set to zero. The Integer objects are maintained normalized, which for this class means that there are no leading zeroed 64 bit words - except for the one zero word for the 0. When subtracting a larger number from a smaller one, the result wraps up and has the size of the larger number. The decrement operator has an unusual behavior - it does NOT decrement below zero to avoid ambiguity. Remarkably, the Integer class is a specialization of a linked list of type MList< unsigned __int64 >. When a number is represented with an object of this type, the underlying linked list is accelerated and thus the words of the number are accessed as an array, achieving performance as if the numbers were indeed represented by an array. The integer class inherits the list as protected access and thus the methods of the underling list are not visible (accessible) from an integer instance. Integer objects throw NumberException only when dividing by zero. This behavior may change in future, removing all exceptions altogether (though this is not likely), or a new operator with an alternative behavior may be provided. The division operator returns a specialized Quotient and Reminder pair, thus helping to prevent errors. 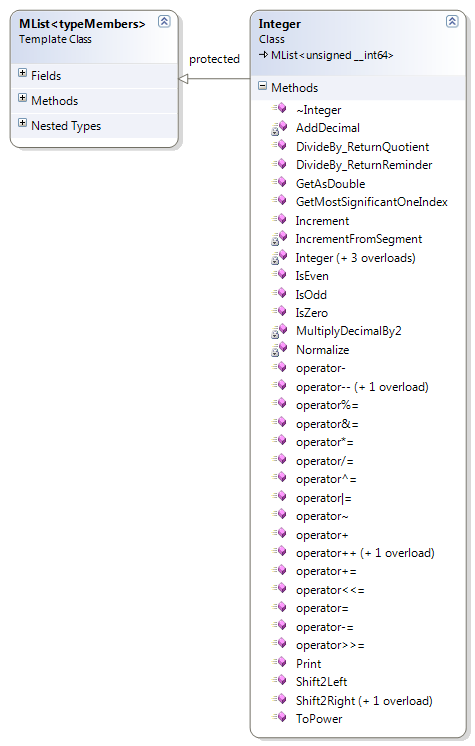 The Boolean operators are NOT overloaded purposefully. The reason is that Integer numbers are NOT Boolean entities and therefore they should not implicitly represent Boolean values. Should one want to use them as Boolean variables, they can use the IsZero() method and the comparison operators appropriately. Objects from the Integer class are able to print themselves using the Print() method. Remark. The Integer class represents N and not Z purposefully. This is necessary to maintain a correct model without redundancies. Signed integers Z⊂Q can be represented using rational numbers with denominator 1. Otherwise there would be redundancies in the sign and computation of every rational number, which is a clear and definitive indication of an inconsistent model. This class uses a number of general purpose classes, such as linked list, string, memory atom, pair and others, available to download with the Proper Numbers Library. For more examples please see the Mean Median Map project. The RationalTBase template class represents rational numbers over an unspecified specializer which must be at least a commutative ring with identity (CRI). A rational entity is constructed by a sign and an ordered pair of numerator and denominator. The objects are always normalized, i.e. the numerator and denominator are always coprime. When RationalTBase is specialized with the Integer class (which represents N (up to available memory)) the resulting type represents Q (up to available memory), i.e. the objects of type RationalTBase< Integer > are rational numbers with arbitrary precision and even distribution, thus they are perfect for precise computations. It is possible to use other types of underlying CRIs, such as unsigned char - Z28, unsigned short - Z216, unsigned int - Z232, unsigned long - Z232, unsigned __int64 - Z264, etc. or applicable user-defined types. Being a commutative ring with an identity, the specializer is expected to have all appropriate operators defined. The behavior of the type is determined by its own nature and also by the behavior of the underlying CRI. For example, overflows (when applicable) may or may not be signaled depending on the behavior of the underlying ring. RationalTBase throws NumberException only when dividing by zero. This behavior may change in future removing all exceptions altogether (though this is not likely), or a new operator with an alternative behavior will be provided. 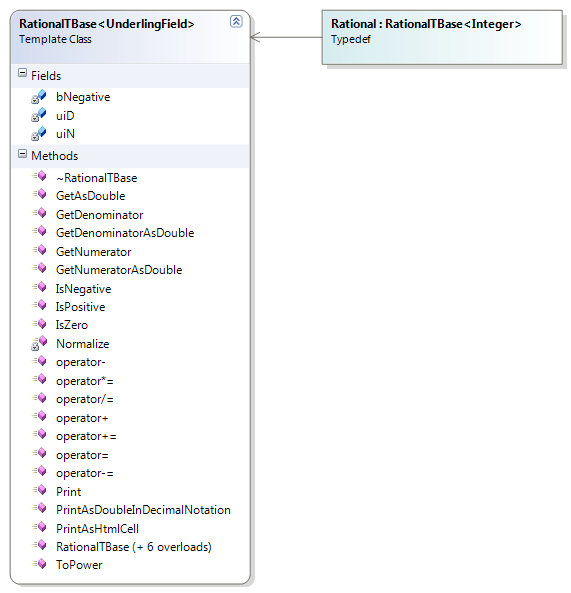 Boolean and bitwise operators of RationalTBase are NOT overloaded purposefully. The reason is that rational numbers are not Boolean or bit-field entities and therefore should not implicitly represent them. Objects from the rational class are able to print themselves in various ways. The Rational is a type definition, specialization of RationalTBase with the Integer class representing arbitrary precision rational numbers. It is ideal for use when precise computations are required. The Rational is a commutative ring with identity (CRI) with all appropriate operators and thus can be used whenever CRI is needed. Functor( x ) := f( x ), where x ∈ Q, f is a Real function. Functional( Functor( x ), y ) := yFunctor( x ), where y ∈ Q.
Quadratic( Functional( Functor( x ), y ), z ) := z + Functional( Functor( x ), y ), where z ∈ Q. Thus the definition of quadratic number is q = z + yf(x), where x, y, z ∈ Q and f is an unspecified real function with inverse. In particular f could be defined as f := √x, f := 3√x, or any other real function with one variable. 1. The declaration above meets the requirement and represents the required irrational numbers, however it is inconsistent in general, i.e. non bijective. 2. It is not possible to have more than one under-functor-variable per universe. 3. Default constructor is not necessary to exist. 4. There is a fundamental problem with quadratic numbers definition or numbers in general. Irrational numbers are very rarely used in general software development as computations are normally carried out numerically and not symbolically. However, this problem is clearly complex and serious, and requires an investigation of its own. The Quadratic template, as defined above, was sufficiently consistent for the Mean Median Map investigation and was successfully used in it; however the problem is extremely interesting and deserves further research. Figure 3. 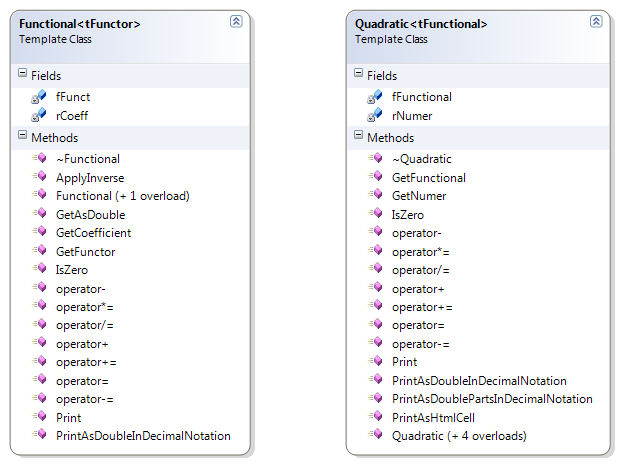 Class diagram of the Functional and Quadratic template classes. Figure 4. Class diagram of the Functor abstract class and two derived from it functors. The Proper Numbers Library is a small, efficient and fast set of C++ classes that allows representation of arbitrarily large integer numbers, arbitrarily precise rational numbers, and irrational numbers. The library is very easy to integrate in any C++ project and be used as if the classes defined in it were native for the language. Not all standard operators are defined in order to enforce stricter Object Oriented compliance than the standard build in types. For example, the number classes have no implicit conversion to Boolean values. Besides, the standard arithmetic operators that the classes have very few complex mathematical functions such as sine, cosine, roots, logarithm, etc, defined on them. However, these can be easily added in future since all of these functions are constructed as series using the standard arithmetic operators. For the most common uses, the classes offer the required functionality. In future, the library will be extended as required and appropriate. The problem with the definition of the irrational number is also very interesting and hopefully will be addressed in the future with the required attention. 1) To maintain the copyright and license notes on the top of each file as they are when you download them. 2) To place a note in the About/Help of your project that it is using the library. If it is possible to add a link to this page will be much appreciated.